39" Posts are used in conjunction with Wire Shelves and Solid Shelves to create a Wire Shelving unit. 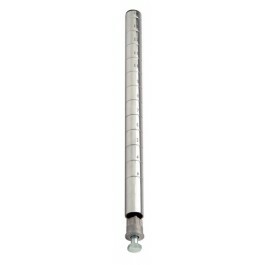 Round posts are fabricated from 16 gauge carbon steel with location grooves on one inch increments. Numbers are printed between grooves for quick assembly. Posts are double grooved in consistent intervals for quick identification. Leveling legs are enclosed with all posts. Leveling legs cannot be used in conjunction with stem casters. Finish: Chrome.